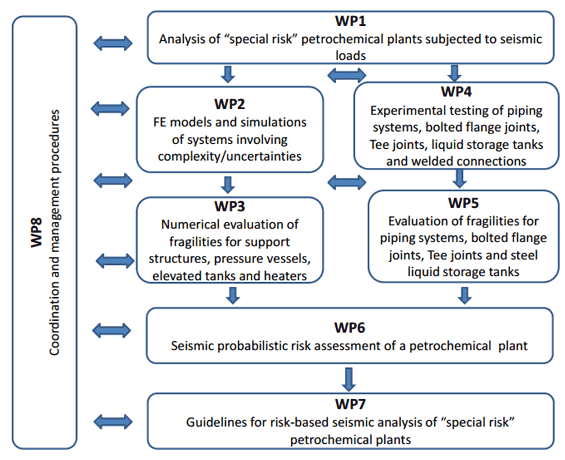 INDUSE-2-SAFETY aims at developing a quantitative risk assessment methodology for seismic loss prevention of “special risk” petrochemical plants and components, e.g., support structures, piping systems, tanks and pressure vessels, flange and tee joints, etc. The proposed probabilistic based methodology will ensure safe functioning / shutdown under ground motions of increasing spectral acceleration through extensive analytical, FE and experimental investigations. Related harmonized importance factors γI and limit state probabilities will a uniform hazard versus a uniform risk basis for EN 1990/EN 1998. The INDUSE-2-SAFETY proposal is the direct continuation of the RFSR INDUSE project (2009-2012) focusing on onshore industrial plants at the system level inside the scope of EN 1998. In detail, INDUSE-2-SAFETY aims at developing a quantitative risk assessment methodology for seismic loss prevention of “special risk” petrochemical plants and components, e.g., support structures, piping systems, tanks and pressure vessels, flange and tee joints, etc. The proposed probabilistic-based methodology will ensure safe functioning/shutdown under ground motions of increasing spectral acceleration through extensive analytical, FE and experimental investigations. Related harmonized importance factors γI and limit state probabilities will provide a uniform hazard versus a uniform risk basis for EN 1990/EN 1998. Evaluation of fragility curves of main structures and components needed for the SPRE analysis, e.g. for support structures, piping systems, tanks, slim vessels, vertical cylinders, spherical storage tanks, flange and tee joints, etc. Experimental investigation of steel storage tanks without/with floating roofs, piping network substructures, flange joints and tee joints by means of cyclic, real-time/pseudo-dynamic and shaking table tests. Phase I (07/2014 – 03/2015) – Introductory/Plant selection, WP1 (UTHESSA leader). Phase II (01/2015 – 09/2015) – Modelling/Simulation phase involving uncertainties, WP2 (ULPOOL leader). Phase III (09/2015 – 06/2016) – Test phase of piping networks/liquid storage tanks, WP4 (CSM leader). Phase IV (07/2015 – 06/2016) – Evaluation of component fragilities, WP3 (RWTH l.), WP5 (CEA leader). Phase V (10/2016 – 03/2017) – Application of PSRA methodology to Case Study, WP6 (UNIRM3 leader). Phase VI (04/2017 – 06/2017) – Issuing of Guidelines for seismic risk assessment, WP7 (IGF, leader). Phase VII (07/2014 – 06/2017) – Project Coordination and Management Procedures, WP8 (UNITN leader). Copyright © 2019 INDUSE 2 safety. All Rights Reserved. INDUSE2safety.